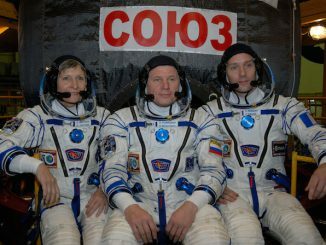 Russian cosmonaut Oleg Novitskiy, French-born European Space Agency flight engineer Thomas Pesquet and veteran NASA astronaut Peggy Whitson put on their Sokol spacesuits, boarded their Soyuz capsule and blasted into orbit Thursday from the Baikonur Cosmodrome in Kazakhstan. Check out photos of their launch day activities. 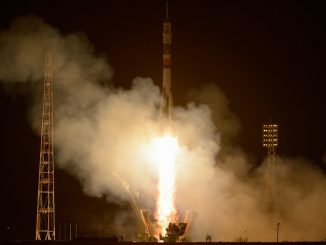 Three new residents completed the final leg of their pursuit of the International Space Station, with docking to the complex at 2158 GMT (4:58 p.m. EST) Saturday, two days after blastoff from the Baikonur Cosmodrome in Kazakhstan. The Soyuz capsule carrying the U.S.-Russian-French crew linked up with the research lab’s Rassvet module. 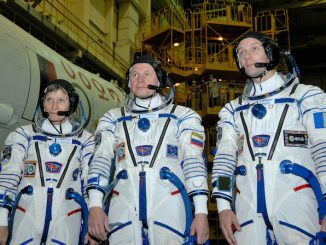 A veteran Russian cosmonaut, a rookie French flight engineer and a record-setting NASA astronaut making her third trip to the International Space Station are gearing up for launch Thursday aboard an upgraded Soyuz ferry craft, kicking off a two-day flight to the orbital laboratory. 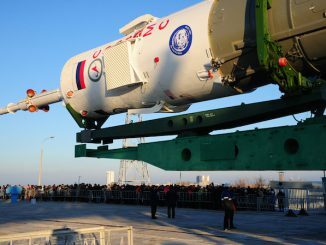 The Soyuz booster that will send the International Space Station’s next three residents into orbit later this week rolled out of an integration hangar early Monday and rode a railroad car to its launch pad at the Baikonur Cosmodrome in Kazakhstan.